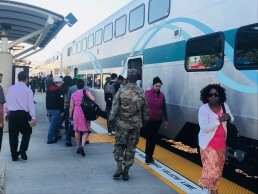 Metrolink has announced that it’s now even easier to avoid traffic and buy tickets for commuter rail services with the introduction of Apple Pay for the Metrolink mobile ticketing app. The addition of this payment feature allows customers to buy tickets with just a tap, eliminating the need to enter credit card numbers, billing information or security codes to complete a transaction. Using Apple Pay is fast, secure, and part of a technology transformation investment that Metrolink has made over the past eight months, which includes a new website, new GPS train tracker, and launch of the “Scan & Go” option that lets Metrolink app users scan their phones at Metro Rail gates to seamlessly continue their travels. Metrolink reports that more than 40 percent of riders are using the Metrolink mobile app to buy their tickets. “As part of our focus on customer service, we are adding Apple Pay so riders have even more choices,” said Metrolink Chair Andrew Kotyuk. To use Apple Pay, customers log in to Metrolink’s mobile app, select a ticket or pass, choose “Pay with Apple Pay” and complete the payment using the Touch ID or Face ID feature. For more information about Metrolink’s technology upgrades, please click here.